MultiJet rotary jet head tank-cleaning range provide exceptional cleanability, better end-product quality, greater overall output and reduced operating costs. 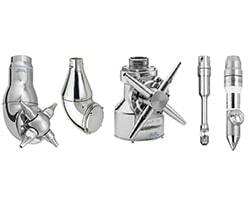 They are designed for industrial application, such as paint, steel, Pulp & Paper, chemical applications. Available in various sizes and different configurations covering any tank size. The Toftejorg MultiJet 40 rotary jet head provides 3D indexed impact cleaning over a defined time period. It is ideal for applications where cost-effective impact cleaning with rotary jet heads is needed, but where compliance with hygienic design standards is not a requirement. The device is suitable for process, storage and transportation tanks between 50 and 500 m3. It is designed to work under conditions where fibres, finer particles, etc. in the cleaning media may be re-circulated through the machine. The Toftejorg MultiJet 50 rotary jet head provides 3D indexed impact cleaning over a defined time period. It is automatic and represents a guaranteed means of achieving quality assurance in tank cleaning. The device is suitable for processing, storage and transportation tanks and vessels between 250 and 1,250 m3. The Toftejorg MultiJet 65 rotary jet head provides 360° indexed impact cleaning over a defined time period. It is automatic and represents a guaranteed means of achieving quality assurance from cleaning tanks. Storage and transportation tanks between 3,000 and 7,000 m3.Used on tankers and in petro-chemical and chemical processing industries. The MultiJet 65 is widely used in product carriers. The Alfa Laval Toftejorg SaniJet 20 air motor driven version. The air motor driven version is equipped with a magnetic clutch providing a leakage-proof transmission and provide an effective drive for low flow machines in rough environments. The air motor has variable speed in order to adjust cleaning intensity. The Alfa Laval Toftejorg SaniJet 20 is designed for use in pharmaceutical, biotechnological, food and dairy processing applications. Tanks and vessels between 0.5-30 m3 (130-8,000 US gallons). The design makes the Alfa Laval Toftejorg SaniJet 20 especially well suited when processing high viscous, foaming or thixotropic products and in chemical processing applications, where product cross contamination is unacceptable and must be avoided. The Alfa Laval Toftejorg SaniJet 20 media driven. The motor driven version is equipped with a magnetic clutch providing a leakage-proof transmission and provide an effective drive for low flow machines in rough environments. The Alfa Laval Toftejorg SaniJet 20 is designed for use in pharmaceutical, biotechnological, food and dairy processing applications. Tanks and vessels between 0.5-30 m3 (130-8,000 US gallons). The design makes the Alfa Laval Toftejorg SaniJet 20 especially well suited when processing high viscous, foaming or thixotropic products and in chemical processing applications, where product cross contamination is unacceptable and must be avoided. The Alfa Laval Toftejorg SaniJet 25 is a sanitary cleaning device of the rotary jet head type for permanent installation that provides a 360° indexed cleaning pattern. Provided it is installed in a vertical position, the Alfa Laval Toftejorg SaniJet 25 is proven completely self-cleaning by the EHEDG test method and self-draining. Using the Sanitary welding connection between down pipe and machine provides a self cleanable connection. All product contact surfaces are AISI 316L, duplex SAF 2205 stainless steel or FDA compliant polymer materials. The Alfa Laval Toftejorg SaniJet 25 is designed for use in pharmaceutical, biotechnology, food and dairy processing applications. Recommended for use in tanks and vessels between 0.5-30 m3 (130-8,000 US gallons) for larger tanks multiple units may be used. The TJ40G rotary jet head provides 3D indexed impact cleaning over a defined period. It is automatic and represents a guaranteed means of achieving quality assurance in tank cleaning. Used in breweries, food and dairy processes and many other industries with a strict demand for hygienic tank cleaning. The device is suitable for processing, storage tanks and vessels between 50 and 500 m3 and industries that require a certain level of hygienic design. The TJ40G is the best-in-class in hygienic design and tank cleaning performance. The smallest rotary impingement tank cleaning device, the Alfa Laval Gamajet 7 easily fits through a 3.8 cm (1.5) access hole. Capable of operating at both high and low pressures, this device offers quick and easy cleaning of barrels, drums, and other small vessels in a wide variety of industries. The Alfa Laval Gamajet 9 offers compact cleaning for small tanks, totes and intermediate bulk containers (IBCs) in both industrial and hygienic applications. With fewer parts and a highly durable design, the Alfa Laval Gamajet 9 provides superior performance and is the most versatile rotary jet head available. This device readily passes through 76 mm (3) openings and can handle high pressures and temperatures, enabling quick and easy cleaning of small totes/IBCs, tanks, trash carts, and much more. Companies are able to clean in-house and in half the time, saving a substantial amount of time, water, and money. With a single insertion of the Alfa Laval GamajetBB, barrels and 208.2 l (55 gal) drums are cleaned in only 2-3 minutes while using only 30-45 l (8-12 gal) of water. This device offers high-performance cleaning combined with maximum durability. A heavy-duty stainless steel gear train remains outside the barrel or drum during cleaning, ensuring a long service life. The Alfa Laval Gamajet BB ultimately saves companies a substantial amount of time, water, and money. The Alfa Laval Gamajet 4 provides high-impact cleaning for large-sized tanks with diameters over 4.6 m (15). This device is fully capable of high-concentration chemical recirculation cleaning and high-pressure, low-volume water jet scrubbing in fixed, automated CIP systems. The Alfa Laval Gamajet 4 is designed to remove the toughest residues from large tanks in the ethanol, paper, pulp, chemical, steel, industrial fermentation, and many other industries that require high impact tank cleaning. The Alfa Laval Gamajet 4 allows companies to spend less time cleaning and more time producing. The Alfa Laval GJ 5 offers compact cleaning for small-sized tanks, vats, and vessels. This device is designed for cleaning tanks 4.6 m (15 ft.) in diameter by 4.6 m (15 ft.) high and can easily fit through 7.62 cm (3 in.) openings. By switching from costly manual cleaning and time-intensive spray balls to the Alfa Laval GJ 5, companies are able to save a substantial amount of time, water, and money. The device is part of the world-renowned Gamajet range of high impact tank cleaning devices. Designed with ergonomics in mind, the Alfa Laval Gamajet 8 provides the same high impact clean as traditional, larger tank cleaners but is lighter, shorter, and narrower. This device is the perfect alternative to heavy impingement cleaners, time-intensive spray balls, and costly manual tank cleaning. Compact and efficient, the Alfa Laval Gamajet 8 allows for space saving while maintaining the impact, durability, and range required for optimal impingement tank cleaning. This device is fluid-driven, eliminating the need for power assistance and is ideal for cleaning stubborn residues in large tanks in a variety of industries such as ethanol, paper, pulp, chemical, steel, industrial fermentation and many more applications requiring high impact cleaning. The Alfa Laval GJ PF is a fluid-driven (turbine-driven) 360° rotary nozzle machine designed for cleaning the interior surfaces of a wide variety of process vessels. With a minimum opening of 174.7 mm (6.875 inches) in diameter for a pin drive machine or 98.5 mm (3.875 inches) for a clutch machine and the nozzles in the vertical position and 97.3mm (3.830 inches) for the low profile machine regardless of nozzle position. It is powered entirely by the cleaning solution and it requires no electricity, compressed air or lubricant for operation. Designed to fit through a 5.08 cm (2) sanitary fitting, the Alfa Laval Gamajet A2 is the perfect alternative to time-intensive spray balls and costly manual cleaning. 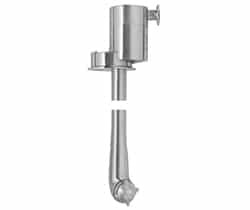 Made of FDA compliant materials, this device is flow-through in design, meaning it requires no grease or oil in the gears. Compact and efficient, the Alfa Laval Gamajet A2 allows for space saving while maintaining the impact, durability, and range required for optimal rotary impingement tank cleaning in sanitary environments. Setting high standards for cleanliness is critical in order to maintain product quality and plant productivity. Thats why we created the Alfa Laval Gamajet A6 tank cleaning device: to deliver powerful tank cleaning that provides reliable, repeatable, and verifiable results to meet the demands of the various sanitary industries such as beverage, food, dairy, and more. Designed to fit through a 7.62 cm (3) sanitary fitting, the Alfa Laval Gamajet A6 is ready for permanent installation and is the perfect alternative to time-intensive spray balls and costly manual tank cleaning. The Alfa Laval GJ A8 is a fluid-driven (turbine-driven) 360° rotary nozzle machine designed for cleaning the interior surfaces of a variety of medium to large tanks and vessels. It is powered entirely by the cleaning solution; it requires no electricity, compressed air or lubricant for operation. The Alfa Laval GJ A8 is designed primarily for portable service; however, the unit may also be permanently installed in a vessel. The field-proven Alfa Laval Gamajet PF provides companies with up to 85% in water, time, energy, and resource savings compared to static spray balls. This tank cleaning device is designed to be flow-through, meaning no lubricant can pass through the gear train. This device is capable of cleaning tanks with capacities between 18.9 m³ - 94.6 m³ (5,000-25,000 gallons). The Alfa Laval Gamajet PF fits through openings as small as 10 cm (4) and operates at low pressures and flows. By implementing this device into their tank cleaning process, companies spend less time cleaning and more time producing.